A pair of $8,500 Preferred 3 events headlined Wednesday evening’s (April 10) card at The Raceway at Western Fair District, and public choices Casino Classic ($3.50) and Lets Leavem ($5.00) failed to disappoint in their respective events. Casino Classic outlasted early inside pressure from Southwind Ion (Austin Sorrie) before claiming command up the backstretch in the Preferred 3 Pace for fillies and mares, but was able to clear before a :28.4 quarter before bracing for an extended first-over push from Top Royal (Colin Kelly) through middle splits of :58.4 and 1:27.1. Casino Classic held her ground under vigorous urging from Ryan Holliday through the far turn, and ultimately coasted home through the final sixteenth to keep Top Royal 1-1/2 lengths at bay in 1:57. Fading Shadow (Nick Steward) circled three-wide around stalled cover above the eighth pole and rallied mildly into third. Robert Manders trains 18-time winner Casino Classic for Richard and Keith Manders. In the Preferred 3 Trot, Lets Leavem sat chilly early behind a :28.1 first quarter duel between Summit City Nate (J Harris” and Full Of Pride (Marc St. Louis Jr.) before following the cover of Heineken Seelster (Robert Shepherd) into contention during the middle stages. With three-eighths to go, Heineken Seelster pushed clear of a Summit City Nate — who stopped abruptly — and Lets Leavem followed into the pocket past three-quarters in 1:29.2. Midway around the final turn, Scott Coulter angled the nine-year-old Angus Hall gelding back off the pegs, and the pair surged clear to a 1:59.2 score. Full Of Pride re-rallied to save second, 4-3/4 lengths back, while Heineken Seelster was an all-out third after tiring from his middle move. 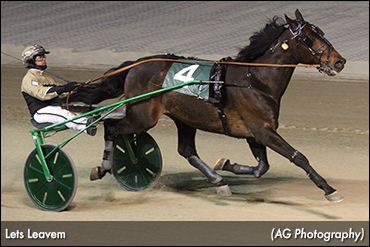 Shane Arsenault trains 26-time winner Lets Leavem for owner Sarah Town. To view Wednesday’s harness racing results, click the following link: Wednesday Results – The Raceway at Western Fair District.